Smilin' John McCain, originally uploaded by marcn. I took a late lunch yesterday and saw John McCain at Nashua's Daniel Webster College. As you can see he does have a natural smile -- compare that to the horrid 'lime green speech' he gave last week. I'd guess there were about a thousand people there, mostly older with a few people in their 20s-30s. 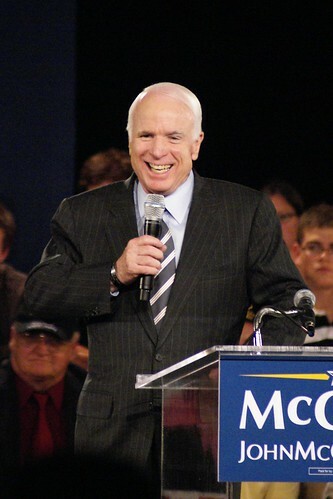 The crowd only applauded once during McCain's speech before the Q&As, and that was after a 'stay in Iraq until the job is done' line. Dead quiet while talking about immigration, social security, etc.